There’s lots of talk in the industry about moving to waterborne, as shops in California and Canada make the switch to meet stringent environmental regulations, and other shops hear about the performance and environmental benefits. Take a closer look at Autowave, the waterborne product line from AkzoNobel, and you’ll find that waterborne is a positive move for the environment and your shop. 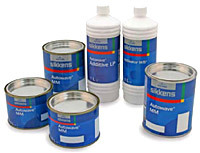 Global concerns about the environment led to the development of Sikkens Autowave, the best waterborne refinish system on the market. AkzoNobel first introduced Autowave in 1992 to European shops, where strict VOC regulations required a move to waterborne basecoats. Today, Autowave is being used successfully in thousands of collision repair shops around the world. AkzoNobel has been working closely with shops in California who were required to make the switch by January 2009, and as the move to waterborne is sweeping the country, AkzoNobel is helping its customers convert. Autowave offers excellent color accuracy, easy application, great hiding, easy blending, excellent metallic control and cost-effectiveness. Many painters and shop owners say they prefer waterborne to conventional refinishes, due to its easy application and blendability. Plus, Autowave’s low solvent emissions make it easier on the environment and safer for painters. At C&D, we can help your shop prepare for a move to waterborne. If you’re ready to learn more, take a look at these resources or contact us.